Expo trains every 6 minutes? Pretty exciting and interesting. 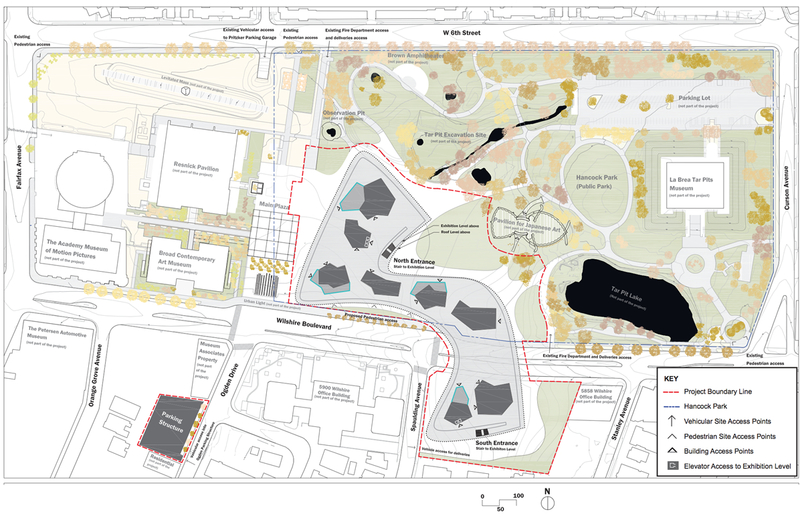 The new structure would replace a couple of older LACMA buildings and span Wilshire Boulevard. 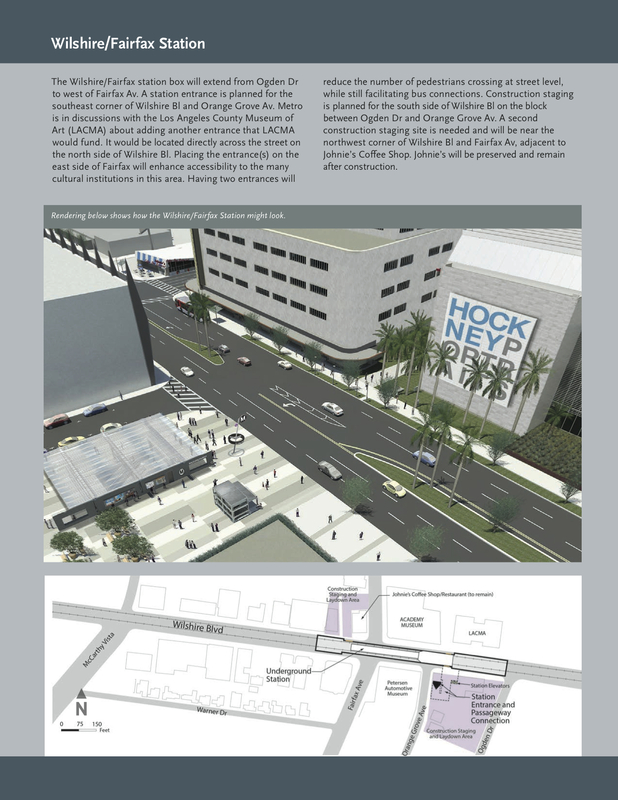 The new south entrance would be two short blocks east of the entrance to the Purple Line Extension subway at Wilshire and Orange Grove. The plan is silent on a possible subway entrance on the north side of the street. There’s a lot happening in the area. The Petersen got its makeover and the Academy of Motion Pictures and Sciences is building its new museum in the old May building at the corner of Wilshire and Fairfax. The La Brea Tar Pits and George C. Page Museum are next door. It’s a short bus trip or less than a mile walk to the Grove. The Los Angeles Sheriff’s Department is investigating after Metro was notified of the video by the television station — it doesn’t appear that anyone on the train called authorities during the incident. We’ve had several other inquiries from media, meaning this will be making the rounds on social media. Riders: if you witness a crime on Metro or see something, then say something. Please either call the LASD’s transit deputies at 888.950.SAFE (7233), call 911 and/or notify the train operator through the intercoms located in each rail car and on every station platform. It’s also a good idea to save the LASD number in your cell phone. Just as a precaution even if you never need it. If on the Red/Purple Line subway, there is cell service available for Verizon and Sprint customers (T-Mobile will soon be able to provide service and negotiations are ongoing with AT&T). Also, please note that the LASD, at Metro’s instruction, has in recent weeks also been putting extra patrols on Metro Rail trains and in stations. For media and others who are looking for more publicly online information on the policing of the Metro system, here are two resources: the most recent crime statistics for the Metro system (January through April of this year) and and an audit of safety and security staffing on the Metro system by the agency’s Office of the Inspector General. The audit was released in early January of this year. In short, transit thrives in good pedestrian environments. For all the talk about using Uber, Lyft and bike share to bridge the “first mile, last mile” gap to transit, it’s far more important to put bus and rail stops in places where people don’t have to walk a mile or more to reach them. Transit needs to be in the middle of the action, not sent to the edge of town. New housing, offices, and retail should be concentrated near it. This means Metro must work with cities — especially Los Angeles — not only to invest in safe crosswalks and sidewalks, but also to reform land-use regulations to nurture inviting walking environments. As another Times opinion piece noted, Los Angeles is a major global city whose zoning codes, parking requirements and development politics treat it like an enormous suburb. For transit to succeed, those laws and attitudes must change. In plain English: build the projects where the population density already exists. Of course, that’s often challenging because the old rail right-of-ways often run through more industrial areas (see: Monrovia) and rail + density = more expensive rail. That said, there are some Metro transit projects that do dive right into the density — the Crenshaw/LAX Line, the Regional Connector, the Purple Line Extension, the transit project on Van Nuys Boulevard in the SFV, the Crenshaw/LAX Line northern extension (a sales tax ballot measure project) and the Vermont Avenue transit project, to name a few. It’s also worth mentioning that Metro CEO Phil Washington is pushing the agency to not just pursue a few developments on property it owns near transit — rather, Phil wants to see the agency work with cities and develop “transit-oriented communities” in which buses and trains are part of the fabric of the neighborhood. As Steve notes in his op-ed, there are a couple of other improvements that scored very high in the TransitCenter’s recent survey: bus shelters that shield people from sun, rain and wind and more frequent and fast service. Neither strikes me as startling conclusions and there are challenges involved with both (mostly involving funding). But transit ridership has been flat across the country and it will be interesting to see how many transit agencies really embrace this type of advice. But I also can’t stress this enough: agencies are mandated to have balanced budgets each year. Not running deficits is a good thing — but until there is an expansion of state and federal dollars to pay for this stuff or cities can find money in their budgets (which have tons of other obligations, such as public safety and pensions), then it’s going to remain a challenge. In the hoplitodromia, or race in armor, a field of 25 athletes ran two lengths of the 210-yard-long (192-meter-long) stadium at Olympia wearing bronze greaves and helmets and lugging shields that may have weighed 30 pounds. Contestants in the target javelin event hurled javelins at a shield fixed to a pole while galloping on horseback, a standard military practice documented by the historian Xenophon. Blue Line resuming normal service with residual delays thru 8:45 a.m.
Metro seems to miss a lot of problems and while we do build an its exciting, there is always a pitfall in another area. The first mile last mile chat has been going on for so long, yet here we are. We have bikes, but packed expo trains. We have bus lanes, but motorists who don’t obey, and a lack of enforcement. I just used to metro app to catch a 720 for a short trip and had to cancel because the time grew from 1 minute to 3, to 5, and then the bus disappeared. As i walked back to my origin, I never saw the bus I assumed I’d be riding. This is tough for people who may be trying the system out. I noticed also, that when The Vermont was being built, it was a great opportunity to build a tunnel crossing into Wilshire/Vermont yet its a missed opportunity; there is Fat burger, jimmy johns,at&t, Wells Fargo, and a few more in comparison to the shops across; Chase, Chipotle..etc. Furthermore, has prevented Metro from looking into providing more entrances, and more entrances to more “surgical” areas. I like to idea of the Pershing Sq station and how it allows exits and entrances from majorly opposite sides of those neighborhoods. This would capture more riders. Not only that, the psychology of being “at home” once they’ve arrived at the station much like turning a vehicle onto ones block is created. Its more than just building and balloons on opening day. Transportation has to be better at going into the social fabric of neighborhoods and working with developers to integrate more like the 7th st tunnel. I agree, its more than just colors and lines webbing across a map of Los Angeles. Rail + Density = More Expensive Rail is not an acceptable Philosophy. This is not a way to fight low ridership on the metro. The way to fight low ridership is to look at the ridership per month. The ridership on rail show the highest is the Red – Purple line. The best light Rail is the Blue Line (L A to Long Beach) and second is Gold Line (L A to Azusa CPU). Density driven Metro shows lower ridership. So that Philosophy of Rail – Density is wrong. Density is the elephant in the room. You can’t run the kinds of frequent and convenient service that people expect without that density of housing and jobs to supply enough riders to support it financially. Look at your top bus lines in terms of ridership. I bet they all have frequent service and run in dense areas. I wonder what your tax proposal would look like if you decided what lines to make rail based on bus ridership! If only there was a way to send pictures and text, subtly, about what was happening around us to a central location at Metro, a place that might have the ability to summon help to a train or station. Perhaps it could be called “Short Messaging Service”. But then we’d need wireless communication devices, and that’s something only seen in science fiction. What amazes me is that nobody got on the horn to the cab about it. It’s not like there aren’t plenty of intercoms throughout every car. During the Los Angeles Riots, MetroRail was literally the safest place in the whole county, PRECISELY because it was common knowledge that at the first sign of trouble, the very next station would be hip-deep in sheriff’s deputies. But that can only happen if somebody knows about it. I still recall a Blue Line motorman saving me from a potentially painful demise at the hands of some disgruntled sous-chef armed with kitchen cutlery, precisely because he was alert to the fact that said disgruntled sous-chef was trying to pick fights with fellow passengers. I’d be more inclined to ride metrorail if there were express trains. I know the idea is complicated and works best in a four-track design, but perhaps in new construction there could be pocket tracks and shooflies integrated where a limited-stop train could bypass the slower “local” ahead of it. Perhaps using technology and automation we could even use the existing crossovers to use the oncoming track as a “passing lane” when an oncoming train isn’t occupying it. As such, for example, maybe a train from Azusa could make only about 3 or 4 high-ridership stops on its way in to LAUPT and speed up the process. I love riding when I don’t have any time constraints, but ride on metrorail takes FOREVER compared to driving, especially on the expo line where stations are far too close together.